More bows (Boze)! Here’s a super easy tangle pattern to start off the month of February. 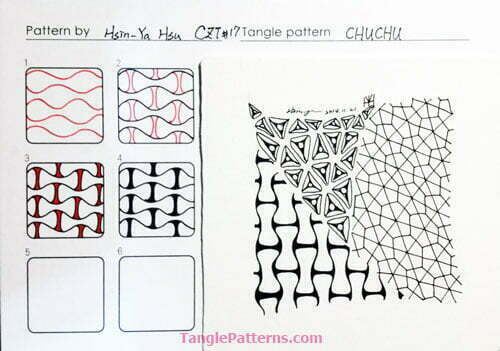 Chuchu is from Hsin-Ya Hsu, who has become a CZT since we last posted one of her tangles. Hsin-Ya is one of many CZTs in Taiwan, last count 33. She writes, “This is a simple and lovely pattern. I think it’s like a bow tie, in Taiwan, men’s bow ties are called chuchu.” And there you have it. Chuchu is a very forgiving tangle. Composed of curving lines connected by a more-or-less curved bracket shape, the fun in this one comes when you add the rounding that finishes this simple tangle. It’s almost like carving a shape with your pen. So cool. Question: what do you do when you know your Sakura 01 Micron has plenty of ink but doesn’t seem to want to make a mark? I think the temptation is to press harder to make the ink release (or in frustration), right? But if you VERY VERY LIGHTLY draw feathery strokes the ink begins to come out perfectly fine again. It might take a stroke or two, but try it. Do just the opposite of what you’re tempted to do. Hsin-Ya illustrates the step-by-step instructions for drawing Chuchu here. Image copyright the artist and used with permission, ALL RIGHTS RESERVED. You may use this image for your personal non-commercial reference only. Republishing or redistributing pattern deconstructions in any form is prohibited under law without express permission of the copyright owner. For more information, click on the image for a discussion entitled “Artists for Respect” by several prominent artists. This tile features several Zentangle-original tangles along with a Chuchu variations. Check out the tag hsinyah for more of Hsin-Ya’s tangles on TanglePatterns.com. I like this tangle. Very simple but I can see some nice variations with this one. Thank you Hsin-Ya. I will most defnitely use this one. 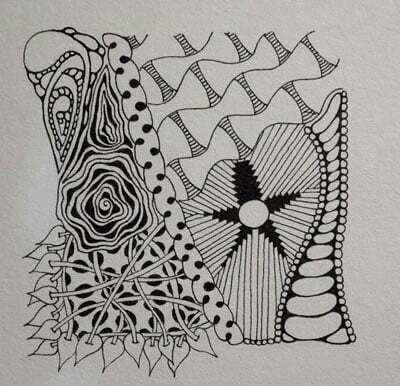 Thank you, Hsin-Ya, for sharing your tangle! It’ll be a lot of fun to play with. Appreciate the tip, Linda, and for maintaining such a useful site. Love the versatility of this……….so many possibilities. Thanks for sharing.